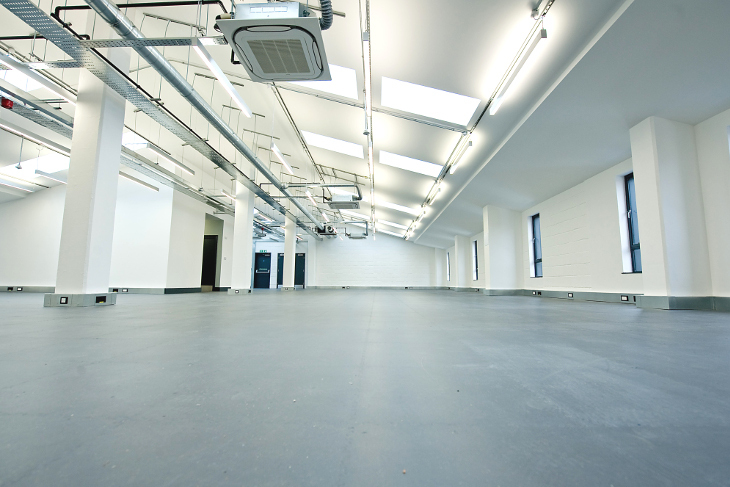 Refurbishment complete at East London Works! Refurbishment works have completed at East London Works, an office building located East to the City, in close proximity to Aldgate and Whitechapel. The area is popular with high profile occupiers as well as a fantastic range of bars, restaurants, cafes and coffee shops. Anton Page are delighted to be marketing an attractive top floor office suite in the development, comprising 3,945 sq. ft.
A comprehensive refurbishment of the entire building has been taking place over the past months and now complete, presents a high specification space and media-style environment. The office available boasts brand new features such as a vaulted ceiling with a 4.4 meter ceiling height, modern light fittings/sky lights, re-decorated common parts, demised kitchenette/ WCs, and air conditioning. There are also several more amenities including excellent natural daylight, a passenger lift, bike storage and showers – all newly renovated. The exterior of the building has also undergone stylish re-branding, fitting in with the thriving, vibrant and increasingly popular district of East London. Contact us for more details, including the marketing particulars, photographs and information on how to book a viewing.